*depends on baseboard, Edison’s RRP without any baseboard is $50, but you need some kind of baseboard to use it. So, down to the benchmarks. 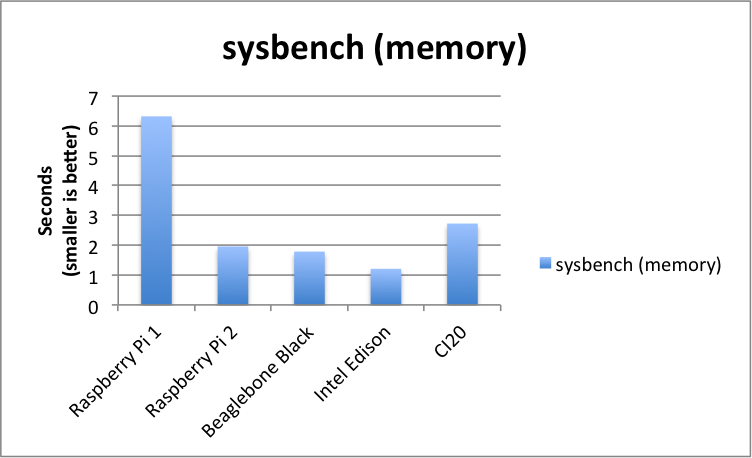 They’re very basic, just running 4 types of test with sysbench. The output is graphed against the other boards previously tested. 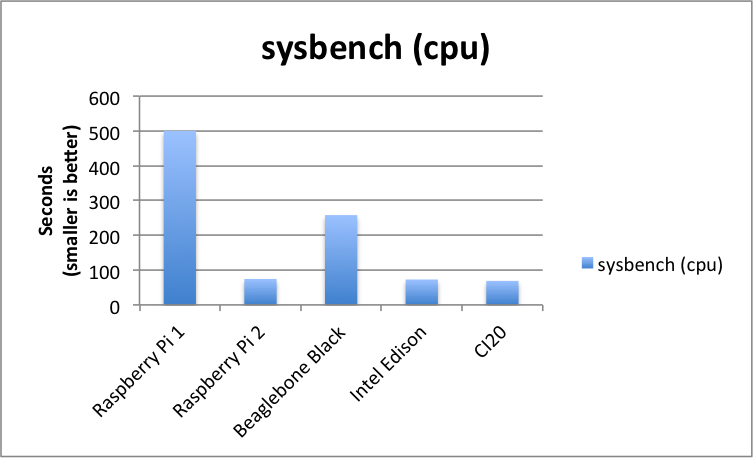 Firstly, the CPU benchmarks which we’re probably most interested to see. I’ll run all the tests with 4 threads, as we have 4 cores on the Pi 2. As expected, it’s a massive improvement over the original Raspberry Pi, and brings it right up to the best of the other sub-2-watt boards I’ve tested. Since I do a lot of battery powered projects, it seems to be a sensible option to pick a cut off for the board selection, and I’ve settled on 2 watts. Sure, there are lots of boards out there that work at higher power draws, but where do you stop, Xeons? 🙂 All the boards in these tests will happily work away at under 2 watts. The Intel Edison is currently the king of those I’ve tested at about 0.38W when idle. Next, it’s the memory test. Again, the 4 cores dramatically improves the results of this particular test over the Pi 1. It’s also 40% faster than the CI20, but doesn’t quite manage to keep up to the BBB or the Edison. Next is the Storage. First the writes. A good performance improvement here. I may have to re-test the Pi 1 with the same speed card as this test, just to be sure of the numbers. Surprisingly good improvement here. Significantly better than all other boards except the Edison, and even then it’s only 20% slower than that. At $35 (plus tax and shipping) it seems really attractive, but you have to remember that you need to add an SD card, a power supply, and maybe a Wifi/Bluetooth dongle to that for your use case. But if you already have those lying around, it’s a hard price to beat. Oh, and if you want to donate a board, I’m happy to test it, as long as it runs at under 2 watts. Drop me an email! By day I’m a senior embedded Linux software engineer. In my spare time, I take pictures, and play with gadgets and technology. That’s looks a good improvement David. Was this with the default clock speed for the Pi 2? It was killing me the lag of R Pi A+ i have. Especially when trying show something to my young fella in SCRATCH. The longer code the slower it was. Question i believe new 4 core CPU will require updated software ? Is it available already online ? Is this rev of Raspberry more heavy on current ? yes the software is available and ready for download. 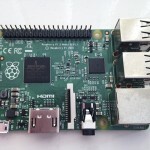 There is a new image available, or alternatively, apt-get update and upgrade will make it Pi 2 compatible. Great review. You rarely see even handed tech reviews anymore everyone has an axe to grind. I have the original RPi B with only 256 MB. I am going to try to use your review to convince my wife its time to upgrade :-). Hi Dave, I was working on your wonderful project the PIPhone using the Pi-B+, however I was unable to get the capacitive touch screen to work. I followed all the instruction to the letter. Do you think the Pi-B+ works with the PiPhone? Joe, drop me an email. Would be interesting to see how it performs overclocked. The bbb seems to do very badly on the random write test. Was that using an SD card or the internal eMMC? Internal eMMC. I just ran it again now to be sure. 42.9 secs. The Pi is clearly a big improvement, but I’m impressed by the Edison which seems to come out top in every benchmark here despite only being 500MHz dual core. Any chance to test Ordroid C1 for comparison? 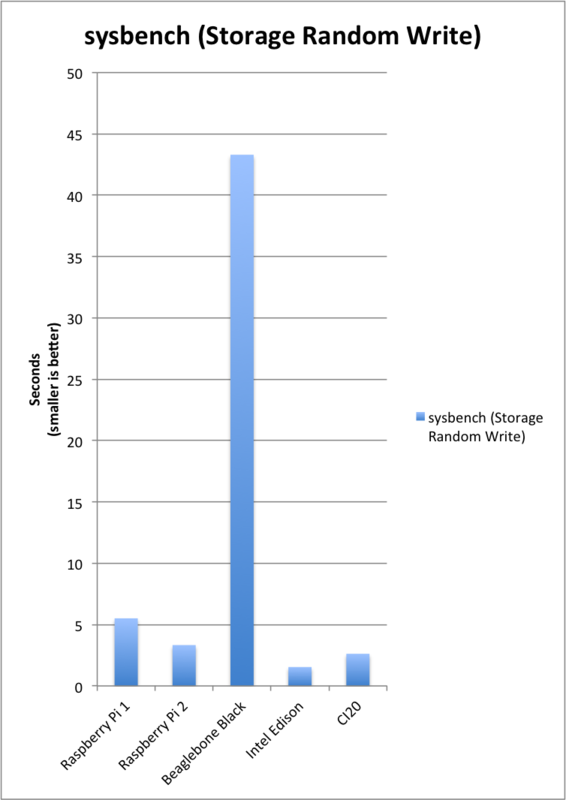 When comparing storage write times, the Beaglebone Black is… very slow. Not sure Alan, but something is definitely amiss. Probably the flash is optimised for reads rather than writes, as the read performance is OK. 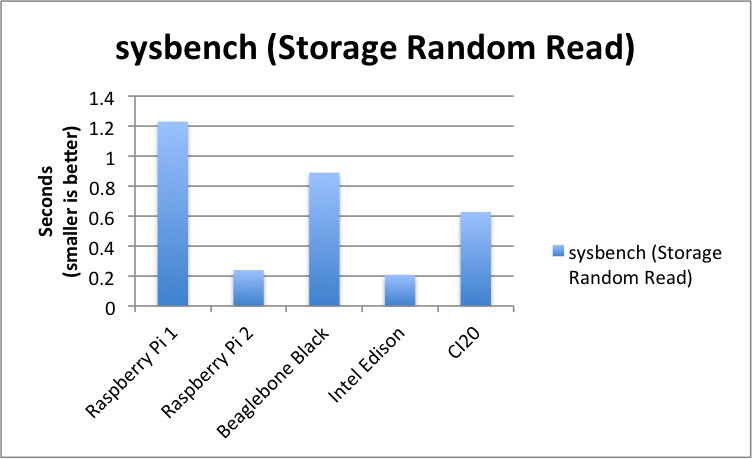 Here the new round http://raspberryparatorpes.net/rivales/sysbench-raspberry-pi-vs-odroid-vs-banana-pro/ with ODROID-C1 and Banana PRO . All the test are the same except that mines are tested core by core. 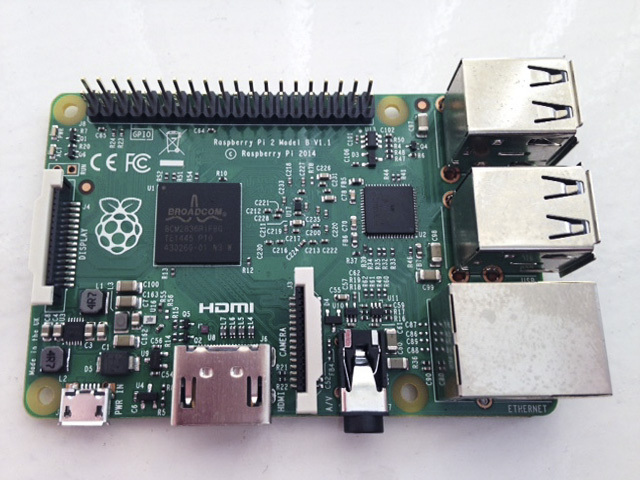 Question on the web browsing with Pi 2 – I found it quite sluggish in Raspbian. Admittedly I was browsing to youtube.com and I’m using a class 4 SD card right now. It was pretty horrible. Is it just that site, or would a class 10 card make a big difference?